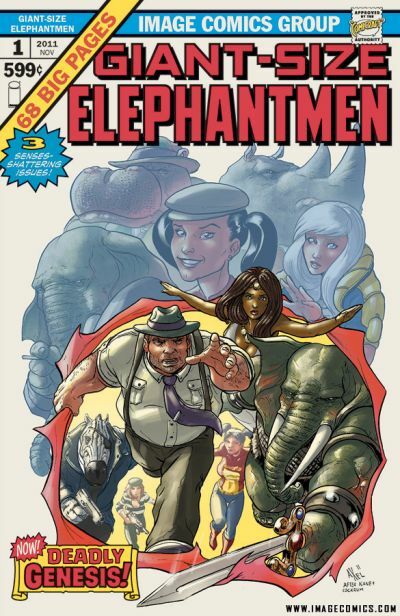 Berkeley, CA â€“ 28 September 2011 â€“ In November, a giant-sized helping of ELEPHANTMEN, Richard Starkings’ increasingly popular ongoing science fiction series, will be available from Image Comics. GIANT-SIZE ELEPHANTMEN #1 will collect the entire sold out Man Or Elephantman story arc, which was previewed in the back of THE WALKING DEAD #86. GIANT-SIZE ELEPHANTMEN #1 will include MAN AND ELEPHANTMAN #1, ELEPHANTMEN #31, and ELEPHANTMEN #32. Plus, it will all be wrapped up by a beautiful tri-fold cover by J. Scott Campbell and Nei Ruffino, as well as a variant cover by regular series artist Axel Medellin. New readers who were intrigued by the flip issue that ran in THE WALKING DEAD #86 are invited to find out what everyone has been talking about in GIANT-SIZE ELEPHANTMEN #1! Set 200 years in the future, ELEPHANTMEN is the story of human/animal hybrids, genetically engineered as biological weapons of mass destruction. The war they were designed to fight has long-since ended and the surviving “Elephantmen” have been freed and rehabilitated to live out the rest of their lives peacefully, despite living amongst those they were created to kill. They are continually treated with suspicion and contempt except by a handful of trusted human allies. GIANT-SIZE ELEPHANTMEN #1 (J. Scott Campbell cover: SEP110368, Axel Medellin cover: SEP110369), a 68-page full-color sci-fi comic for mature readers, will be on sale in stores November 2 for $5.99.